On Monday, April 1, 2019, founding faculty member Dr. Kristin Burns passed away. A mother, wife, educator, and true hero, Burns died in her final battle with cancer, surrounded by her immediate family. Kris Burns impacted many lives during her time on earth, both in the classroom and outside of it. Here are tributes to the woman who made Christendom possible for people across the globe. As a former student of Dr. Burns I was sorry to hear of her passing. She was a phenomenal professor. I consider myself extremely fortunate to have known her even in this brief instance. I will already remember her. I am a 2011 alumna in Sacred Theology. I am so grateful to have had Dr. Burns as a teacher and adviser. I began taking classes in the Graduate School just after I joined the Church as an adult convert in 2003. When I began the program, I never imaged that I would actually pursue a degree; the exercise was really for my own personal enrichment. However, after a while, it became clear that God had other plans. I was an investment banker now seeking more insight into what God had to say about work and the responsibilities of wealth. I have a distinct memory of Dr. Burns asking me about why I chose to study at Christendom. My response was that I wanted to study in a place that was true to the Magisterium. Intuitively, I knew that I needed to go right to the source. She smiled and assured me that I was at the right place. Taking one class at a time– I finally graduated… but not without Dr. Burn’s philosophy classes. I remember the title of one of my favorite papers for Dr. Burns–Aquinas and Freud Share a Beer: Looking for Happiness in All the Wrong Places. Again, she smiled and continued to encourage me. Fast forward to 2015, when I began my doctoral studies at Georgetown University. Again, encouraged by Dr. Burns. Later this year I will defend my dissertation: The Theological Nature of Work and Wealth as the Basis of Contributive Justice and the Moral Foundation for a New Social Contract. This work is enabled me to open up theological truths to promote a new normative ethical theory. I am indebted to Dr. Burns for the foundation in Philosophy that she gave me. Without her lessons, this project would not have been possible. I am grateful to Dr. Burns and my association with this special graduate school. Peace be with us all, and may God hold and keep Dr. Burns. Thank you, Dr. Burns for being such a wonderful professor. I will always remember our summer classes- the combination of your good examples, joy, and way of engaging all of us in class. I am very grateful to you and pray that you are now enjoying beholding the face of your very dear Lord. Dr. Kris Burns was such a joyful person, and a wonderful (and fun!) philosophy professor. She will be greatly missed. She always made me feel important when she saw me even many years after graduating, although I was just one among so many of her former students! She has left behind an amazing legacy in both her family and professional lives. A real trailblazer and role model for strong Catholic women! Dr. Burns will always be in my prayers and memory. One could not but love her as helpful teacher and friend. Please post the hymn I will be turning to today for comfort as it reminds me she rests in the embrace of God in heaven for eternity. Around the Notre Dame Institute epoch, I had the grace of being a student of Dr. Burns. Later, I had the privilege of being a colleague of Kris at the Graduate School. In both cases: Kristin P. Burns was a true daughter of the Church. “Merciful Lord Jesus, grant her everlasting rest” (based on The Raccolta #583 [1957 ed.]). All I can remember of Dr. Burns was that she was a very sweet person and I liked her from the first day I met her, and she always had a smile in her face and that smile was for every student in the Graduate School — not just for me. I will miss her, and my prayers are with her and her family. May She Rest In Peace. Dr. Burns taught two classes of philosophy to the deacon candidates of my class, 11 of us who were ordained in January 2015. She had her hands full with 11 grown men, of various professions, all outside academia or philosophy. But she was more than up to the task. Her courses were important to our education and underpinning of our later theology courses. I don’t know how many other deacon classes she taught, but she will certainly be missed by this member of the class of 2015. I live in California and the first time that I met Dr. Burns was when I attended summer school at INDGS several years ago. It was the first time in my adult life that I had been able to take time off work and just concentrate on school. I drove by myself across the U. S.
I got to the school a few days before school began and wandered around the empty campus. I didn’t know what to expect and was a bit nervous of going back to school. The first day that I met everyone it was like old home week. Dr. Burns seemed happy to see everybody who was returning and greeted the few of us who were new to NDGS. with genuine joy and interest. I immediately liked her. Her philosophy classes were amazing – I was stunned to realize how reasonable our faith was from a philosophical point of view. She made it easy to comprehend and interesting. I stayed in the dorms with a few other people, not too many; it was wonderful. Dr. Burns would often stay after class And hang out with us. I can remember watching a movie with her and thinking what a dumb movie this was. I knew that she shared my point of you because we looked at each other at one point, rolled our eyes and started cracking up. Here she was, one of the smartest persons I had ever known/ laughing with me over something so silly. It still makes me laugh every time I see the movie because I think of her. On another night, she had the graduate students over to her house for dinner to meet her wonderful family. Later that summer, I was blessed to give her young daughter a ride down to a bluegrass festival in southern Virginia as part of my trip home. Every summer that I was there was like a John Denver song. :-). I know that sounds sappy but every time that I hear country roads I think of the beautiful campus of Christendom on the Shenandoah River, my memories of Dr. Burns, and all of the staff at Christendom. I am greatly blessed to have had known her. She was a wonderful, kind and intelligent woman who will always hold a dear place in my heart. May she Rest In Peace. It was because of Dr. Burn’s promptings that I attended the graduate school. I was her dentist and friend for 30 years. She will be missed. I met Dr. Burns as a fairly new graduate student in 2003…..I was about 1/4 of the way through the program and had just had a baby, so she was helping me figure out a way to complete all the course requirements in a reasonable amount of time. I very much remember her kindness and words of encouragement to me as a new mother, made particularly poignant since our sons had the same first and middle names….Gregory Michael. Although she jokingly said that I needed to have a girl named Karen and another boy named Edward (the names of her other children), I now wish I had taken her advice and had more children! Dr. Burns taught both of my required philosophy classes and made some pretty “heady” concepts simple, relevant, and totally comprehensible even to a rather “philosophically dense” CPA! I will miss her kind heart and joyful spirit. May she Rest In Peace. Dr. Burns was a fantastic teacher very inspiring in her commitment to wisdom in the real life. The virtue of fortitude was quite obvious in the way she was responding today’s challenges. “I prayed, and understanding was given me… I accounted wealth as nothing in comparison with her… I determined to take her to live with me, knowing that she would give me good counsel and encouragement in cares and grief. Because of her I shall have immortality, and leave an everlasting remembrance to those who come after me. Give me the wisdom that sits by thy throne… for even if one is perfect among the sons of men, yet without the wisdom that comes from thee he will be regarded as nothing. With thee is wisdom, who …understands what is pleasing in thy sight and what is right according to thy commandments. Send her forth from the holy heavens… for a perishable body weighs down the soul, and this earthy tent burdens the thoughtful mind. We can hardly guess at what is on earth, and what is at hand we find with labor; but who has traced out what is in the heavens? Who has learned thy counsel, unless thou hast given wisdom and sent thy Holy Spirit from on high? And thus the paths of those on earth were set right, and men were taught what pleases thee, and were saved by wisdom.” (Book of Wisdom 7-9 passim). In 2005, the Vita Consecrata Institute ( a summer school program for consecrated persons) found its home at Christendom College with the Notre Dame Graduate School of Theology. Dr. Kristin Berns was the dean of Theology at that time until very recent. She was a great supporter of the program and very much loved by the priests and religious who attended. Those who were in the graduate program had her as an instructor and everyone spoke highly of her as a teacher. The others knew her because of her presence on the campus during the summer sessions and her personal interest in them. Her personality naturally attracted people and brought the best out of them. She will be greatly missed. However, our faith teaches us that life doesn’t end but only changes. She certainly was a witness to the faith and has passed on to her eternal reward. I will celebrate Masses for her and I am certain that the hundreds of priests and religious who have passed through the VCI over the years will join me in offering many prayers for the repose of her soul. May she rest in peace. I studied under Dr. Burns during my first two semesters in the master’s program an NDGS and have wonderful memories of the experience. In fact, Dr. Burns’ classes so inspired me with a love of philosophy that I completed a minor in classical philosophy as part of my doctoral program and treated certain aspects of Aristotelianism in my dissertation. In addition to her teaching ability, Dr. Burns was one of the most cheerful people I have ever known. Combined with her philosophical acumen, her personal sparkle meant that she brought a ray of intellectual sunshine into her students’ lives and a ray of personal sunshine into the classroom. In 2005, the Vita Consecrata Institute, a graduate program focused on the Consecrated Life, which had been wandering in search of a permanent home for many years, found an amazing and grace-filled welcome at Christendom College. It was a match made in heaven. I was on the staff of the summer graduate program of the VCI in a few of those first years. I had already exchanged emails with the “Dr. Burns” who had been so instrumental in making this happen. I had interacted with her several times on campus that summer before we happened to be sharing a meal in the cafeteria and one thing led to another in the conversation and we both looked at each other suddenly realizing that Fr. Norbert and Dr. Burns were the Jeff Wood and Kristin Popik of 1974. It was a happy, totally unexpected reunion. Both of us had pursued our special “calls” in the meantime, she in giving herself totally to the foundation of this magnificent Catholic college, I in my decades as a Norbertine priest. Dr. Burns may have sensed the impact she had on my education, but I wish I had the opportunity to tell her myself. When I heard I had to take philosophy for my graduate degree, I cringed. I had only taken one philosophy class as an undergraduate at a state university, and it was not a positive experience. I absolutely loved her class and looked forward to it every week. She completely changed my outlook on philosophy. I had the pleasure of being her student twice. Dr. Burns personally encouraged me to follow up my two philosophy courses by taking Virtues, which in turn lead me to adding the Moral Theology concentration to my degree pursuits. Had it not been for her inspiring teaching and personal guidance, I likely would not have pursued this additional concentration, which turns out to be my real passion. Thank you Dr. Burns. When I close my eyes and picture you now, I see you in the loving and joyous embrace of Jesus. I will always remember you. My prayers for repose of the soul of Dr. Burns and God’s grace for her family during this difficult time. I very fondly remember Dr. Burns. I am a single dad and divorced. Dr. Burns would often take the time from her busy schedule to see how I was doing with my then 2 teenage children as well see that my studies were progressing. Attending NDGS and being with such Faithful faculty and students was surely a Blessing and for which I will always be grateful to God, Dr. Burns and Christendom. Dr. Burns was a very kind, approachable and caring Dean with all her students as well as a very gifted teacher of philosophy. RIP Dr. Burns. I was a student of her philosophy class in 2014. I remember first that we had a Christmas party together as a class because food is really memorable, but I am more grateful to her for her explanations during class. It was my first time learning philosophy and I felt like I was learning things I had missed knowing my whole life. Dr. Burns was that rare combination of intelligence, wit, and compassion that is missing in much secular higher education and in society these days. As a brand-new graduate school student returning to the classroom after many years, she taught the very first class I took at NDGS: “Philosophical Errors.” Despite being an older student, Dr. Burns made me feel welcomed and her presentation of the material was eye-opening and compelling — leaving me excited to join the pursuit for the truth that is NDGS master program. Logic and truth is exactly what I received at in her classes as well as in other NDGS classes along with humor and many memories. Dr. Burns also appreciated the many challenges I and my fellow military veterans faced during our careers and encouraged us to steer our desire to serve into a passion to spreading the Gospel. Indeed, it was with tact and humor Dr. Burns finally sent me an email after I had taken many courses reminding me it was finally time to take the Comps and graduate-taking the knowledge I learned at NDGS into a world thirsty for the truth. I did, and it has been her memory that encourages me to be fearless and imaginative in doing so when faced with the roadblocks of a post-Christian world. For that I am also grateful for having met and had her as a professor. May she be in God’s presence for a vocation well-realized and a heart that gave its all. Dr. Burns introduced me to a whole new world of philosophy. I never even knew that there was such a thing – rational reasons to believe, that had been proposed centuries ago, by brilliant minds?! This was just what I needed at a a time when I returning to my Catholic faith. I also remember how kind and friendly she was to my then 5 year old and 2 year old (who are now 13 and 10!) who I had to bring with me to a meeting with her. She never knew this, but apparently, she had a great impact on them because for weeks after as I was driving them to school, they would chant “Let’s go see Dr. Burns!” and then burst out laughing. I have no idea why! I am so thankful that Dr. Burns (and William Carroll) founded Christendom. Through the grace of the Holy Spirit, I credit the formation I received there for my strong Catholic faith today. I so appreciate the gift of Dr. Burns’ philosophy instruction. She has been a great encourager and a true inspiration for learning and the pursuit of truth. Dr. Burns was always hilarious, but without knowing it, was always joyful, and had the ability to make any philosophy question simple and understandable. I am an online-distance student, so I never actually met Dr. Burns in-person, but her warmth, intelligence, and candor in the classroom made me laugh so many times, smile all the while, deeply enjoy and understand life’s deepest and most important philosophical questions, and look forward to the day that I would be able to laugh with her in-person. She was brimming with joy and wisdom, and made it look so easy! I will miss her and we never even met! When my husband Tom died in 2003, Christendom was on the Spring break pilgrimage to Rome and Dr. Burns was with them. Tom and I had just finished that past summer taking a class from Dr. Burns. She sent me a message from Rome telling me that she had had a special Mass said for Tom from the Chapel at Assisi. She encouraged me the following summer to continue taking classes at NDGS and one class was especially fun that summer after Tom died. She would often give examples of beer and pizza in that class which I think was on God and man. In our class of several students were the Pax Cristi Sisters who one day had extra tacos. Sabatino (now Father Hezekias) brought a pack of beer to class in order to pull a prank on Kris. He gave out the six pack to each of us and told us that the first reference that Kris made to beer and pizza, we should all raise our beer cans. And so it happened and so we did! Kris just burst out laughing and called a break and we went out to the back of the Commons and enjoyed beer and the Sisters tacos! My third best memory was the encouragement she gave to me to get my MA in Theology! I will be forever grateful for that encouragement. May you, Kris, now enjoy that heavenly reward that you taught about to us so well! I would like to say that I never had the pleasure of meeting Dr. Burns in person, since I was part of the long distance program, but her lectures were extremely influential in my personal life. In fact, it would not be an exaggeration to say that if it weren’t for her philosophy classes, I would most likely be an agnostic. She provided amazing lectures on the work of Saint Thomas Aquinas and was quite engaging in the delivery of the class material. I will forever appreciate Dr. Burns and will keep her in my memory and prayers. I remember meeting with Dr. Burns in about August of 2014. I was applying to transfer from the Augustine Institute to Christendom College’s graduate school, so I visited the campus in Alexandria to meet with her. She was incredibly gracious and welcoming; I quickly knew that I had made the right decision in transferring to Christendom. She was very witty too and had such a fun personality. Thank you, Dr. Burns, for being a significant part of my journey to Christendom – studying there has had a major impact on my life and my faith. May you rest in peace, Dr. Burns! I remain deeply grateful to Dr. Kristin Burns for encouraging me to pursue a graduate degree in Moral Theology, long after my retirement from a full time career. More than a decade later, this experience at Christendom continues to influence my ongoing work with the Holy See as well as my personal life at home. Her enthusiasm, dedication and love for the Graduate School and its mission touched all of us who came into contact with her; she will be deeply missed. Requiescat in Pace. I had the great privilege and pleasure of participating in the graduate school during the summers taking up residence at Christendom’s campus in Campion Hall. My wife and I will be forever grateful for the four summers of prayer, study, and fellowship in Front Royal. We will always remember Dr. Burns opening up her home to graduate students for a BBQ, sitting with us during meals, or simply enjoying a beer and conversation with her. Dr. Burns was one of the best teachers, who made Thomistic psychology and metaphysics clear, which is a rare gift. She was a patient and funny professor and mentor, whose feminine genius will be missed by all who had the great blessing of sitting in her classroom. May the angels lead her to paradise where she can contemplate Wisdom Incarnate for all eternity! Thank you, Dr. Burns, for teaching me Philosophy. We will miss you; especially your sense of humor! May you Rest In Peace. Dr. Kris Burns was the first one to give me a teaching job, even while I was still in graduate school. That led to a collaboration that lasted nearly 20 years. I watched as Kris guided the graduate school with skill and grace. Unlike most administrators, she was a fantastic and beloved teacher who was at the same time no-nonsense and charitable. For me she was an invaluable colleague and friend. I remember many summer parties at the Burns’ house, conversing and laughing. We worked closely together, and I watched her shepherd the graduate school through many changes and exciting developments. It was a blessing to have one of the founders back at Christendom after the merger in 1997. I will miss her very much, and the summer session will be emptier without her capable, courageous, and kind presence. I wish I could be there for Mike and the family at this time. They and Kris are in our prayer. I spent a lot of time at NDGS with Dr. Burns, Dr. Joe Arias, and Miss Heidi Kalian during my time in graduate school. Dr. Burns immediately made me feel welcome and embraced into a community that was entirely foreign to me coming not only from California but also from a totally different career field. Making that giant leap, Dr. Burns personally encouraged and supported me beyond everything she taught me in class which was extensive in and of itself. I enjoyed frequent lunches with her and the NDGS staff and all the laughs we shared because she had such a good sense of humor. And of course, I appreciated how well she got to know me and all the time we spent in her office talking about many things. She was amazing and I will truly miss her. I loved Kris Burns. She was always a positive person and wanted me to learn philosophy with a true understanding. In 1993 I started taking classes at the Notre Dame Institute. She taught me philosophy in a way that I could understand and I will forever think of Kris when pondering “is-ing”. In 1994 I was expecting our first baby and early on during the pregnancy we learned that he would most likely die at birth. Everyone at NDI was so wonderful during this time especially Kris. He did in fact die but I continued with my studies and having more babies. Eventually, I stopped taking classes due to lack of time with small children at home. Some years later, I ran into Kris after Mass at St Agnes in Arlington. It was so good to see her and she wanted to know if I ever finished my MA. I told her I had not and that I only had a few classes left to take. Frequently my tendency leans negative and I did not think I would ever finish. Without her encouragement and active help, I would never have received my MA in Theology in 2002. It took me 9 years and she helped me get an exception to the 8 year rule. I am so grateful to Kris and always considered her my friend. May she be rewarded in Heaven and continue to help us on earth with her generosity, thoughtfulness and tremendous sense of humor! I was privileged to have Dr. Burns for several graduate courses. She was an excellent professor who engaged the class with in-depth lectures as well as intriguing questions. More importantly, she cared about each of her students as individuals and as Christians who would eventually take the gospel of Christ into the world by whatever means we were called to do so. I chatted with her in her office on a number of occasions. She was always sincerely interested in my career and other endeavors. She will be greatly missed. Whoever takes her place on the faculty will have some large shoes to fill. May the Lord bless her forever. Thank you, Jesus, for Dr. Burns, a cherished gift for Christendom College. Dr. Kristin Burns was an exemplary mentor, instructor, and philosopher. Her warm, welcoming smile and good sense of humor were guaranteed gifts upon arriving at Christendom for the NDGS summer sessions. I give thanks to God for the opportunity to have both studied under and been directed by her. Word of Dr. Kris Burns’ death, and the naming of her outstanding personal gifts and professional contributions to Catholic Higher Education, awaken deep gratitude. Among Dr. Burns’ personal qualities, evident at the Graduate School of Christendom, was a simplicity/humility that understated her achievements. A woman of the Church, Kris was a quiet stability point, a shrewd keeper of the wisdom of faith, matched with a droll sense of humor. It is still rather startling to read, at her death, of her Doctoral Studies at the Angelicum, Rome, and her co-founding of Christendom College with Dr. Warren Carroll. Her Transitus at this hour of United States history illuminates Gospel realities of the relationships of women and men. An image for Kris might be the mustard seed. She trusted what was small, both in co-founding Christendom and later, in faithfully “watering” what Father W. Saunders, Luther Nehoff, friends, and generous scholars had made possible in Alexandria, Virginia. I remember simple lunches in the small table in the kitchenette at the Graduate School, where a few members of the staff, instructors, and students could share food, ideas, and bantering. Kris made everyone welcome. I first met Dr. Kristin Burns in the summer of 2014. It was my first summer at Christendom College graduate school. I heard so many amazing things about her from my religious Sisters who had the privilege of knowing her in the past, gaining so much from her as a teacher and friend. My first thought when I met her was “She is such a warm, down-to-earth and caring person”. Later that summer, she opened her home to all the graduate students for lovely dinner with a spirit of great camaraderie, conversation and laughter. There was this acute intuition in her to know how to help students, especially around midterms and finals, a caring and empathy. I remember she took us to the nearby vineyard to enjoy a relaxing wine tasting afternoon. She drew people to God and each other with her welcoming, charming candor. I was blessed to take some online classes from Dr. Burns. I admired and enjoyed her brilliant, spiritual and practical presentations. Most of all, I witnessed her deep faith in God and love and affection for her family, a love which generously encompassed many. I miss you, Dr. Burns, not only as a professor, but as a friend. I keep you present in prayer, and your family in my prayers also. I count on your prayers for us as well, so we can also live a virtuous, faithful and love-filled life in God and for one another. I am so honored and grateful for having known and received Dr. Burns as a humble, funny, caring professor and dean for the last 5 years. Her example has inspired and instilled in me the continuing love of learning and teaching. May her soul rest in peace. Dr. Burns welcomed me as a student in 2007, with the joy and utter delight that only she could give. She had tremendous faith in our desire to grow in knowledge, specifically for the spread of the Kingdom. She gave us the best of everything, not just in her classes but also in the other professors she provided, the extensions that helped us finish our classes, and the personal time and attention that was so much the face of Christ. Words to describe her: encouraging, filled with the hope and joy of the Holy Spirit, calm, clear thinking, attentive, good-humored. She was brilliant but never let that make a distance between her and her students or their progress. When I came to Alexandria for comps in Oct 2011 she was so grateful to receive catechetical materials for her alumni in Africa who were on mission there. She always had the Kingdom in mind. 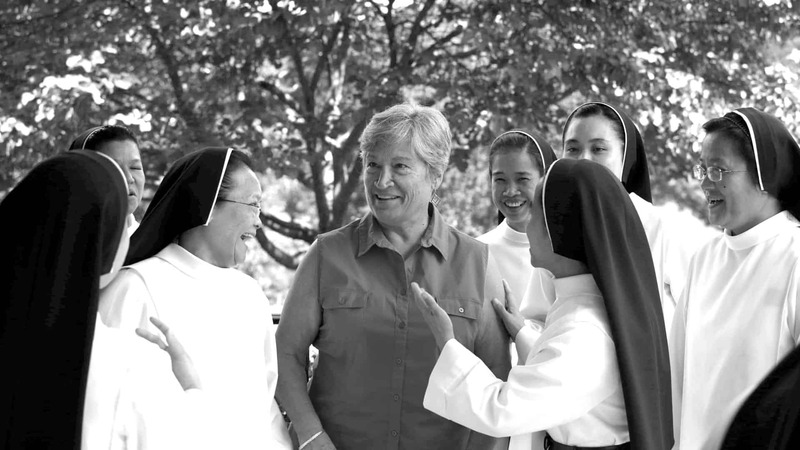 She was absolutely inspirational in what she created, in how she tended its growth, for each of us Sacred Heart Sisters who have attended Christendom’s Notre Dame Graduate School. I love her, continue to pray for her, will miss her very much. The thing that I remember most about Dr. Burns is her patience. She dealt with all my questions with kindness, taking time to explain things in a way that I would understand. To me this speaks to her depth of knowledge and her love of the subject of Philosophy. She also had a way of remembering and caring for each student. I was only there for six weeks in the summer but when we returned it was if we had never left. We just picked up conversations where we left off. She was so generous to open her home to us often. I can’t (won’t) think of Christendom Graduate School with our her. During a Graduate School social at which I last saw Kris, I introduced myself to her companions as her “philosophical son” (I am of African descent). I believe Kris was as amused as her companions were bemused! That introduction was lighthearted but earnest. As a former evangelical Protestant, I dismissed “philosophy” as intellectually prideful skepticism. Yet in Kris’ class “God and The Soul,” I was exposed to that fruitful philosophy which, far from producing skepticism, lifted the mind to apprehending reality as a wondrous communion of existence beautifully diverse in essence, ultimately signifying a universal Creator whose Essence is Existence. Through Kris’ vivid and mirthful presentations, metaphysical concepts appeared not only comprehensible, but truly delectable. I like many were blessed to sit in Kris’ pedagogic kitchen as she served up philosophical soul food, spiced with flavorful insights such as “Each thing does its own act of ‘is-ing‘,” and “Our minds are ‘essence-traps’.” To this day I have revered Kris as my “philosophical mom,” whose heritage to me is a perpetual source of delight and consolation through contemplating the wondrous harmony of all truths given through the Faith and rightly appreciative reason. Please God, I will use this rich heritage so as to join Kris and all her philosophical offspring in forever delighting in the unveiled Beauty, Truth and Goodness of God and all creatures perfectly united in His Love. Although I did not ever meet Dr. Burns in person because I’m a distance student, I feel that her teaching has greatly impacted my life. Her classes are among my favorites from the courses I took. I am so grateful to have been able to learn from her and grateful to have all the brilliant notes pages and information from her classes. It was very clear from her lectures that she was a great teacher and a great woman. It is hard to put into words the effect Dr. Burns had on my life. When I was a young teacher, I found myself at a crossroads after a particularly stressful year of teaching. As Providence would have it, I received a pamphlet in the mail from a graduate school in Virginia that I had previously heard nothing about. I decided to call the school to inquire about the summer courses being offered there, and was quite impressed that the Dean herself answered the phone! Dr. Burns was so joyful and encouraging, that my mind was made up by the time I got off the phone that day. A year or so later, a vacancy opened up at the grad school for the position of “administrative assistant to the dean.” Although I was quite intimidated (I had never held such an important title before! ), I decided to apply. I still remember my interview fondly. Dr. Burns and I met for lunch in the cafeteria at the college. She said to me quite bluntly, “I don’t even know what to ask you. I never do these things (interview people).” I realize now that she was just probably trying to put me at ease, as I was quite nervous. She went on to explain some details of the job, adding that it would likely require some public speaking. She then noted that I seemed a little shy. I replied, “Yes, I am. If you find someone better for the job, that’s okay.” Dr. Burns smiled her typical all-encompassing smile, and before I knew it, I was offered the position. The one thing I remember most about Dr. Burns is that she loved life and she loved the people God placed in her life. She always seemed to see the best in everyone, and by doing so, she called out the best in each of us. She was also the very best boss I ever had. Who else took hour-long lunch breaks with their staff to grill burgers together and soak in the sunlight? Dr. Burns was a brilliant, joy-filled, beautiful woman of God that I had the great privilege of working with and studying under. May she know the peace and joy that she radiated on all she met. Thank you for everything, Dr. Burns! May you rest in God’s peace! I have very fond memories of the philosophy classes with Dr. Burns that truly opened my mind and instilled a love for deep thinking and wisdom. I am also grateful for her academic advising that helped me finish the Masters degree in theology on time. She was truly an inspiring teacher and a person of deep faith and convictions. As I sat in Dr. Burns’ Philosophy class (many years ago) I never thought that one day I would be blessed to call Kris my colleague and my friend. While a young graduate student, I struggled with philosophy but Kris made the subject matter come alive and her pleasant demeanor and patience in the classroom helped this philosophically challenged student learn the material in order to pass those classes and later comprehensive exams. Kris was a very hospitable person and I remember a fun night of food and drink at her house after the Class of 2001’s graduation. Kris was always ready with a smile, a hearty laugh, and genuine interest in the other person. I am forever grateful for her confidence in me and her decision to hire me to teach Church History at the Graduate School. That decision changed my life and provided opportunities that I never dreamed of. Her support and mentorship was a highly treasured gift. When embarking on the daunting task of writing my first book with a house full of children, Kris graciously provided me access to the Graduate School building and a welcome sanctuary so I could complete that project. Knowing that I have a great interest in the historical writings of Hilaire Belloc, Kris informed me she was decluttering her personal library and asked if I wanted her Belloc books, which I immediately accepted. They remain on my bookshelf and serve as a reminder of her thoughtfulness and love. Thank you Kris for your service, dedication, and love of the Church, Christendom College, the Graduate School, and the faculty, staff, and students, whose lives you immeasurably blessed. I will always be grateful to Dr. Kristin Burns. I remember the huge map of Rome that covered the wall in her office. I pointed out where we had been on our honeymoon; she pointed out the Angelicum and where she had studied. She was the first woman to earn a doctorate there. She was thoughtful, gregarious and always welcoming to students. She used to host Thanksgiving for students who were away from their families. I’ll always remember her debating philosophy at lunch. In the classroom, she was incisive, clarifying the details of existence versus essence. Personally, she was warm and always glad to share her blessings: from stories about her three children, who she loved from the bottom of her heart to her proudly finished retirement home to her exceptional cooking as well as her life’s wisdom. She was intellectual and practical; sharp and friendly; firm and loving. She taught me philosophy; she stewarded the college and its graduate program; she loved her husband and children. She was an exceptional woman, a servant of God and model of faith in action. Why study Philosophy? Because Dr. Burns is teaching it…that’s why…and she’s beyond excellent!!! Thank you Dr. Burns for bringing philosophy to life for me! And, thank you especially for the gift of your leadership and dedication to NDGS. Attending NDGS has changed my life forever! You live in my heart! You led all of us, your students to Him, now He says to you: Come, enter into my Heart! God called you to Christendom, to proclaim His love and bring His children closer to Him by sharing your knowledge with faith, hope and love. You were there with a mission to change lives for the good. Your love, kindness, knowledge, conviction, zeal, strength and virtuous personality impacted me and all those you have taught. Your classes were calling us to reach a deeper realty and understanding, and philosophy became available and embraceable to us through your explanations. I personally want to thank you for the respect and kindness that you extended to all religious. Your support and the firm teaching and foundation of Christendom encouraged our Community to send our Sisters with trust and confidence to accomplish their degrees. Thank you! And thank you for all your prayers and correspondence even after I finished my studies. Our friendship will live forever because it was born in the Heart of Christ. Farewell, my dear Friend, you will be greatly missed on this side of the “veil”, yet you will continue to present us to God with your continued friendship and prayers in the heavenly court. My love and prayers accompany you. Obviously, we will all always remember Dr Burns for her kindness, intelligence, humor, dedication, and generosity, but there is one particular incident that will always stick with me. At the time, my hair was fairly long and Dr Burns was trying to encourage me to cut it. When I complained that hair cuts cost money (always an issue for poor graduate students), she offered to solve both problems—my finances and my long hair—by cutting it herself, gratis. I agreed and she gave me a haircut in the lobby of the graduate school. I don’t know if she ever did that for anyone else, but I’ll never forget she did it for me.